What happens when you add Medicine, Transhumanism, Nanotechnology, 3-D Vaccines, SEAS, MSR’s, Dendritic cells, HIV, Ebola, Cancer, and Mesoporous Silica, to the subject of Immunology and what does Wyss Institute Founding Director Donald Ingber, M.D., Ph.D. have to say about it? As Medicine speeds headlong ever quicker into the Trans-human age, the line between vaccines and Nanotechnology becomes tenuously thin . Particles 100,000 times smaller than the width of a human hair, that are programmable, spontaneously assembling and can access every conceivable fibre of the body, including a placenta are becoming the miracle cure-all of the near future. Enter the development by Scientific Research of “on demand” nano-vaccines using genetically engineered proteins. This development has made it now possible to produce the effect of nano medicine with larger objects. That is, a non-surgical, injectable and spontaneously assembling structure. For example something like a constant 3-D vaccine in the form of a particle cluster injected beneath the skin. One that would manipulate cells, as well as release bio-chemical drug constituents. Sound implausible? -Trials have already been completed on mice. Researchers at the Wyss Institute for Biologically Inspired Engineering and Harvard’s School of Engineering and Applied Sciences (SEAS) are in the process of developing Injectable, spontaneously assembling, inorganic scaffolds that modulate immune cells in vivo to increase vaccine efficacy. This technology will allow for the creation of 3D structures using minimally invasive delivery to enrich and activate a host’s immune cells to target and attack harmful cells in vivo. Nano-sized mesoporous silica particles have already been established as useful for manipulating individual cells from the inside, but this is the first time that larger particles, in the micron-sized range, are used to create a 3D in vivo scaffold that can recruit and attract tens of millions of immune cells. rod-like structures made from silica, , can be charged with biological and chemical drug components and then delivered by needle just below the skin. The rods spontaneously assemble at the vaccination point to form a three-dimensional scaffold. When a harmful presence is detected, surveillance cells that monitor the body and trigger an immune response pass through the porous spaces in the stack of MSRs that are large enough to recruit and fill up with dendritic cells. Synthesized in the lab, the MSRs are built with small holes, known as nano-pores, inside. The nano-pores can be filled with specific cytokines, oligonucleotides, large protein antigens, or any variety of drugs of interest to allow a vast number of possible combinations to treat a range of infections. an immune response, the activated dendritic cells leave the scaffold and travel to the lymph nodes, where they raise alarm and direct the body’s immune system to attack the offending cells, such as cancerous cells. At the site of the injection, the MSRs biodegrade and dissolve naturally within a few months. By tuning the surface properties and pore size of the MSRs Researchers hope to also manipulate the immune system and control the introduction and release of various proteins and drugs by proxy. 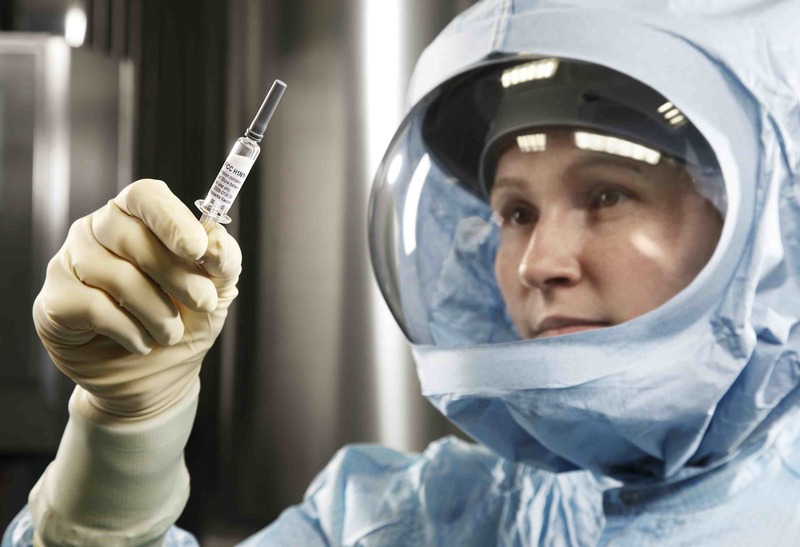 Using this technology makes the manufacture of these vaccines relatively easily and rapidly so that they could potentially be widely available very quickly in the event of an emerging pandemic. 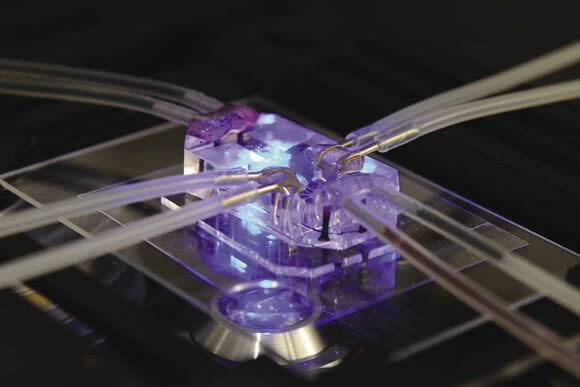 The usefulness and practicality of these 3D vaccines is in their mobility their injectable nature makes them easy to administer both inside the operating environment and outside in the field. Could the Cure for indiscriminate worldwide killers like HIV, Ebola and cancers lay in the promise of Nano-technology, and is the cost of this miracle cure-all the robotization of the human body. Is Trans-humanism, amalgamation and symbiosis between the natural and mechanical world the only future for Humanity? -Modern Medicine thinks so. As Wyss Institute Founding Director Donald Ingber, M.D., Ph.D. says. “These injectable 3D vaccines offer a minimally invasive and scalable way to deliver therapies that work by mimicking the body’s own powerful immune-response in diseases that have previously been able to skirt immune detection.” But isn’t this what a healthy diet, regular exercise, purified drinking water, clean air do? Very interesting how can I find out more?